Munich is Germany’s 3rd largest city and it is absolutely incredible. Munich is the capital of Bavaria and home to centuries-old buildings and museums. The city is well known for its annual Oktoberfest celebration and its many beer halls, including the famous Hofbräuhaus, founded back in 1589. A visit to the Altstadt aka Old Town alone is worth visiting Munich, in my opinion. The Altstadt is where you will find Marienplatz square jam packed with elaborate architecture and home to many landmarks, including Neo-Gothic Neues Rathaus (town hall) and the acclaimed glockenspiel show. We stayed at Citadines Arnulfpark Munich last summer with 2 adults and 3 kids. We found our room large enough for us and were quite comfortable. There was a full kitchen, but we didn’t utilize it. There was a really neat coffee machine in the lobby and I just got my coffee from there. It was nice to have our own room and put the kids in the living room on the pull out sofa. Wifi was included in our rate, but not breakfast. The dryer takes a long time to dry down in the laundry room. Do not overload it. There was a large park with playground equipment behind the hotel. Public transportation was available right outside of the hotel. 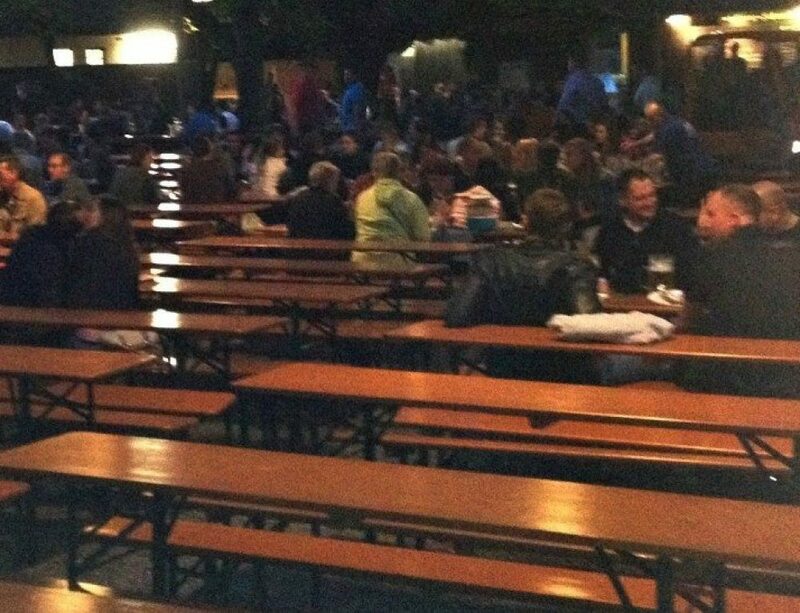 Augustiner Keller the largest beer garden in Munich. I don’t recall any of the food being that good, but this was an experience. You can eat at the restaurant located within or just hit the food window and grab food to take to a picnic table. The grab in go option is the much cheaper option. Munich Hofbräuhaus is a 3-floor beer hall dating back to the 16th century, with a Bavarian restaurant, live music and an upbeat vibe. This is a great place for kids to get a pretzel bigger than their head. Stroll around Marienplatz, the central square in the city center of Munich, Germany. It has been the city’s main square since 1158 and it is spectacular. Just walking around and seeing the architecture is amazing. The two-tier Glockenspiel on Marienplatz is one of the biggest tourist attractions of Munich and a great place to go to with your family according to Stories by Soumya. This huge, mechanical clock was built into the tower of the New Town Hall in 1907 and has been a favorite among kids and adults ever since. It consists of 32 life-sized figures and 43 bells that come to life every day to depict the wedding of a 16th century duke, a jousting match, and a traditional Bavarian dance. The figurines move and rotate to different tunes on the bells and are an absolute delight to watch. The show starts at 11 am and noon every day and lasts for about 15 minutes. During summers, there is an extra show at 5 pm. The Glockenspiel is almost like a tiny Munich ritual that you cannot afford to miss when you are here. The Viktualienmarkt is a daily food market and a square in the center of Munich, Germany with 140 stalls and shops offering flowers and plants, fruits and vegetables, venison and fowl, eggs, butter, honey, fish, meat, sausages, herbs, spices, delicatessens, wine and tea. The Viktualienmarkt developed from a farmers’ market to a popular gourmet market. Blutenburg Castle is an old ducal country seat in the west of Munich, Germany, on the banks of river Würm. The present complex reflects the structure of the 15th-century moated castle with its main building, with a surrounding wall with towers and spacious outbuildings, which are dominated by the chapel. Therme Erding is the second largest thermal bath complex in Europe just 30 minutes north of Munich. Bath complex isn’t a good enough explanation because this place is a spa/water park. It is 185,000 square meters and has a wavepool & 27 slides area. The 2700 meters of slides offer three different difficulty levels for any age. The spa offers over 300 types of treatments. You can stay for a few hours or for a whole day. Prices vary on how long you stay. The BMW Museum is an exhibition in the new BMW building. It’s made up of simple displays, that do not intrude on the characteristic architecture of the museum. Over the years, the increasing number of visitors turned the BMW Museum into one of the most frequented company museums in Germany. Oktoberfest is the world’s largest Volksfest. It is held annually in Munich for 16-18 days. The folk festival starts in mid to late September and continues on until the first weekend in October. Dachau is a concentration camp and it was one of the first of the Nazi concentration camps opened in Germany. It was created to hold political prisoners. 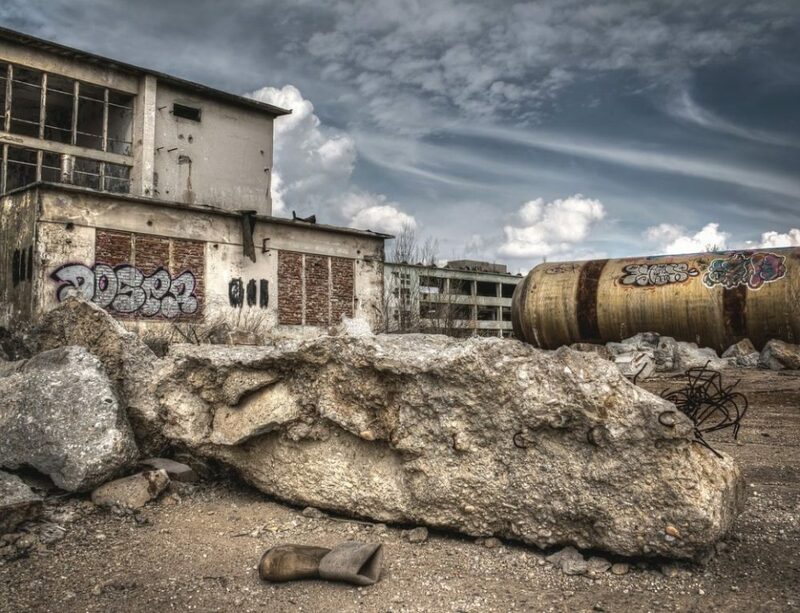 It is located on the grounds of an abandoned munitions factory northeast of the medieval town of Dachau, about 16 km northwest of Munich. The memorial site is open daily from 9:00 am to 5:00 pm. 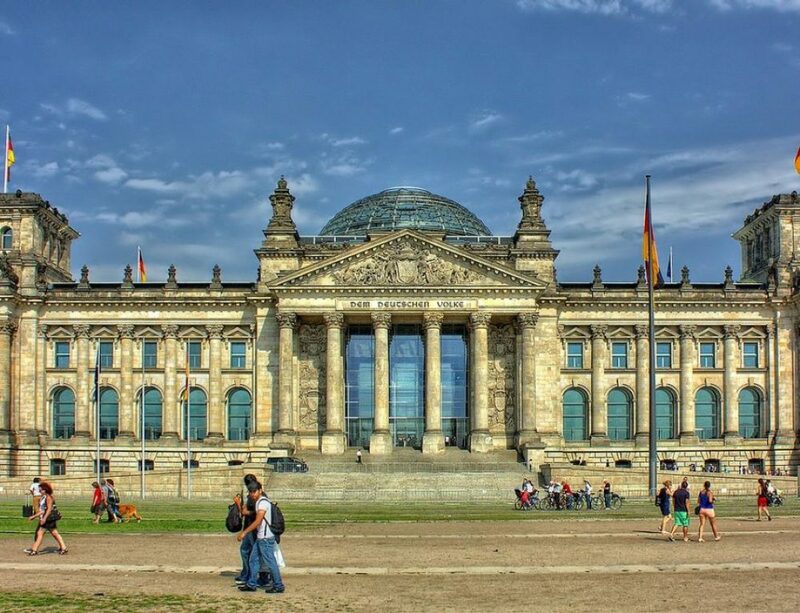 The Deutsches Museum in Munich is one of the world’s largest and oldest science and technology museums and one of the best places to visit in Munich for families. The exhibitions are amazing and contain information about space, aviation, computers, energy and electricity, our oceans and the history of medicine. When visiting with children Our Overseas Adventures says a must-do is the Kids Kingdom located on the ground floor of the museum. It’s packed full of fun activities that will keep all ages occupied for hours. Our kids loved playing in the giant guitar, building a ball rolling track, constructing things out of huge building blocks, and arts and crafts. The hall of mirrors is hilarious and you will hear plenty of giggles as the kids check themselves out – often multiple versions of themselves thanks to the clever placement of the mirrors. If you have a budding pilot in tow, then the aeronautics hall is a great place to learn about the history of flight. A highlight is the only surviving example of one of the Wright Brothers’ planes. The astronomy and space section is also fascinating with a planetarium, solar telescope and sundials. Much of the Residence was destroyed during the Second World War, and from 1945 it was gradually reconstructed. Today, with the museums of the Bavarian Palace Department (the Residence Museum itself, the Treasury and the Cuvilliés Theatre) along with other cultural institutions, this is one of the largest museum complexes in Bavaria. The Asam Church is a Baroque church in Munich, built from 1733 to 1746 by brothers, sculptor Egid Quirin Asam, and painter Cosmas Damian Asam as their private church. It is one of the most impressive things I’ve ever seen and it’s free to go in. It’s near Marienplatz. A visit to Munich’s Englischer Garten – one of the world’s largest urban parks – is a must according to the International Desserts Blog! Divided into two main sections, most visitors head for the smaller southern portion. If you prefer peace, quiet, and locals, head to the northern section of the park. 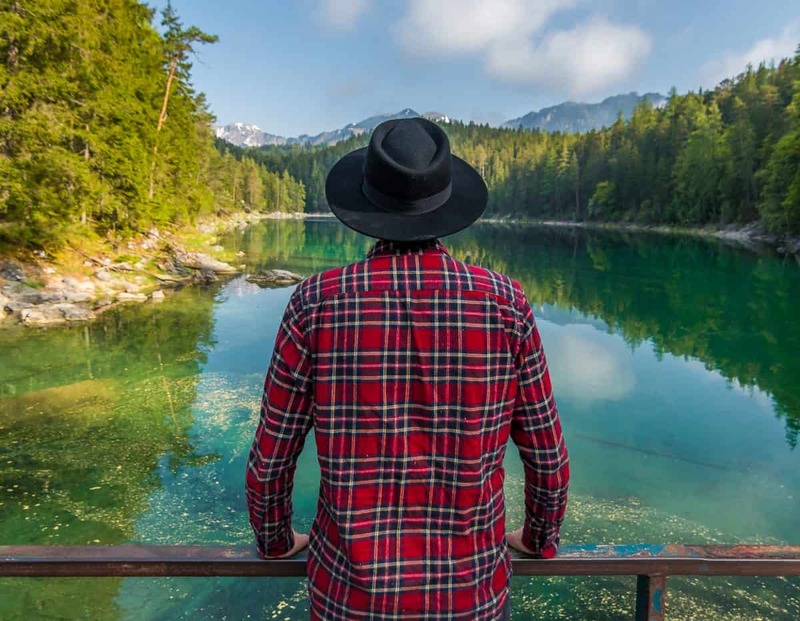 What can you do in the Englischer Garten? Here are a few ideas: take a stroll, jog or bike ride on one of the numerous trails, grab a beer at a Biergarten (the largest is next to the Chinese Tower and there’s also one near a playground in the northern part of the park), experience a tea ceremony at the Japanese tea house, watch surfers surf the natural rapid created by the river that flows through the Englisher Garten (it’s mesmerizing! ), sunbath in the Schönfeldwiese (where clothing is optional! 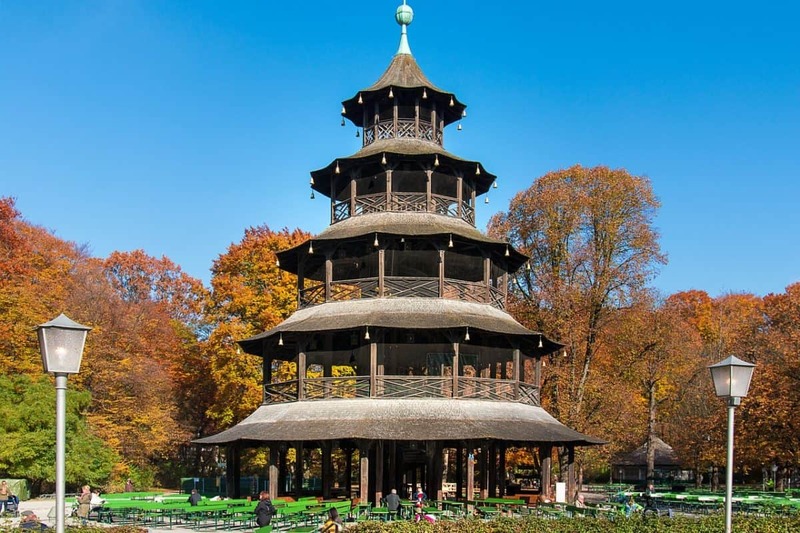 ), see the 25-meter tall Chinesischer Turm (“Chinese Tower”), rent a paddleboat at the Kleinhesseloher Lake, just to name a few. It’s easy to spend several hours to a whole day (or more) exploring all that the Englischer Garten has to offer. No matter the time of year, it’s a beautiful place to visit right in the heart of Munich. According to Carolyn from Holidays to Europe a fun activity that the whole family will enjoy in Munich is a visit to Munich Zoo. Officially called the Hellabrunn Tierpark, the zoo is more of a nature reserve than a traditional zoo and is laid out to represent the natural habitat of the animals. Animals from all around the world are housed at the zoo, including giraffes, tortoises, kangaroos, rhinoceros, flamingos and monkeys. Each day there are interesting talks by the keepers of the elephants, tigers, zebras and polar bears, and you can watch sea lions being fed and experience a birds of prey show. As well as seeing the exotic and domestic animals at the zoo, other attractions for children include a petting zoo and two playgrounds. Munich Zoo is open year round and is easily reached by both train and bus. Schloss Nymphenburg is a wonderful attraction for families. Popular with visitors who are first timers to Munich and locals alike, the Palace is a marvelous example of baroque architecture, which served as a summer residence for the Wittelsbach Royals of Bavaria. But the main draw for youngsters and their oldsters will be the magnificent grounds which consist of natural forested areas with wide allées perfect for strollers and bikes. As well, Nymphenburg’s formal gardens are a riot of color, laid out in symmetry with water features and bridges, from which little ones can feed ducks and geese or launch paper sailboats. It’s a bucolic setting in one of the loveliest suburban neighborhoods in Munich. The mixture of nature and beautiful architecture makes a Munich one of the best places to visit when you have kids. The Olympia Tower is one of the famous spots to see, it has an overall height of 291 m, it is the 7th tallest building in Munich. The tower has an observation deck where Munich can be viewed from at 360 degrees. Should you get hungry, there’s a revolving restaurant at the height of 182 meters. 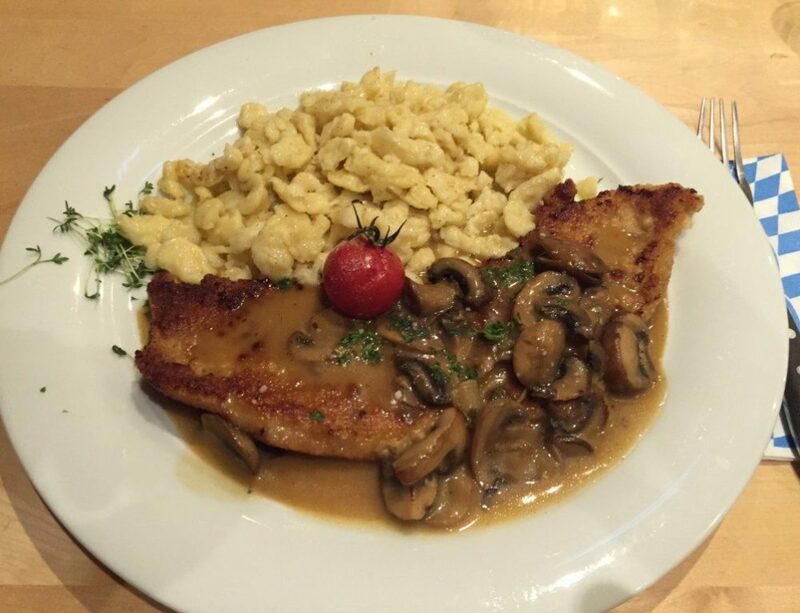 They offer grilled tuna, braised beef, roasted lamb crown, duck leg, scallops, among other Bavarian dishes and your choice of wine, local or international recommendations are available. Kids would love apfelstrudel and their ice cream selection, too. The Olympia Tower is strategically located near other “things to do” areas for kids. The Olympiapark where it is located has a duck pond where you can go boating, there’s also a mini-golf area, tennis courts, and wide space for inline skating. There’s also a zip line option, you get to go across the iconic Olympic Stadium via zip line! Otherwise, you can just walk on the roof of the Olympic stadium if you don’t feel like flying, there are organized tours for doing this or doing both. SEA LIFE Munich, a domestic and tropical underwater world is also in the area – it’s not as big as Singapore’s, but the kids would definitely love interacting with marine creatures. One of the best parts of staying in Munich is how close it puts you to other sights worth checking out. There are so many places within just an hour or two drive that are incredible. Here are 11 of our favorites. 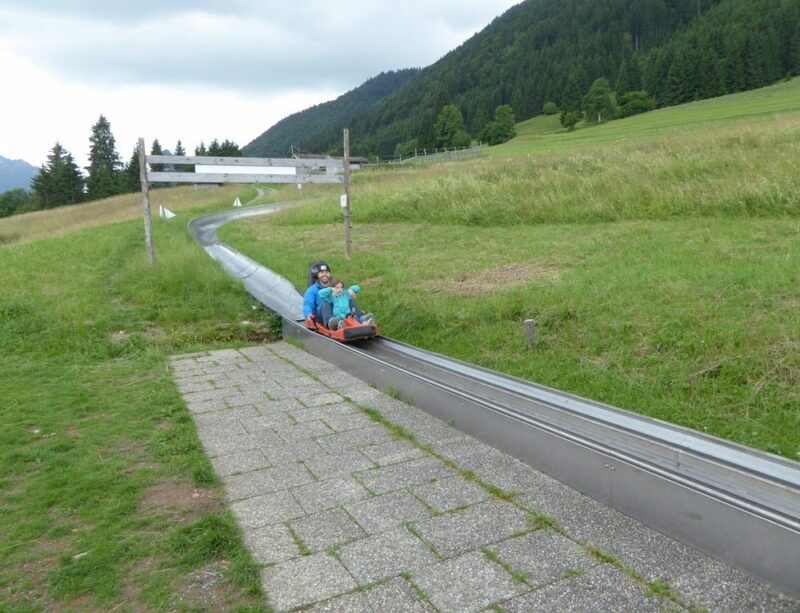 The alpine slides in Germany are awesome. Our favorite one near Munich is Sommerrodelbahn am Skistadion. Alpspitz is an area extremely high up where you can take up a cable car and enjoy incredible views and hikes. Another spectacular castle worth visiting in the Alps next door to the most famous castle in the world. One of the coolest hikes we’ve done anywhere in the entire world was the Parnach gorge hike! Just south of Munich in the foothills of the Alps is the fairytale castle of Neuschwanstein. 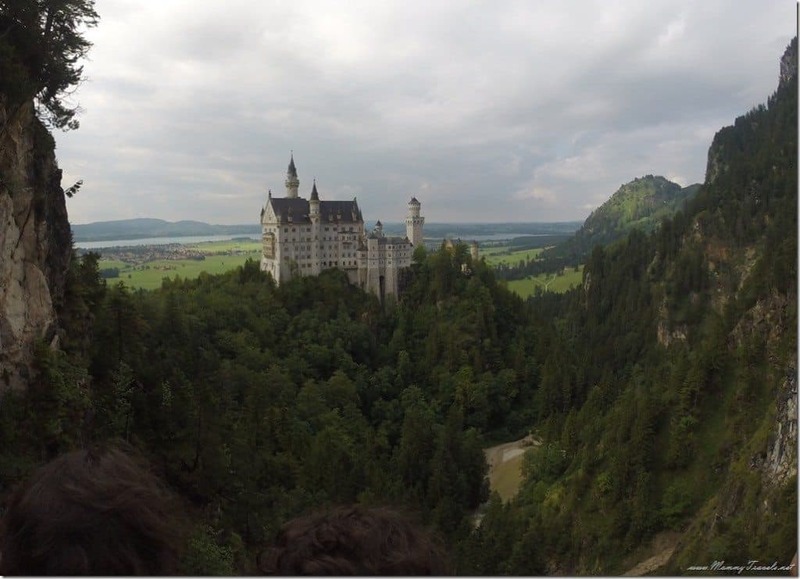 As the inspiration for the Disney’s Sleeping Beauty Castle, Neuschwanstein is a great day trip from Munich for families according to Show Them the Globe. The scenery is stunning and both kids and parents will love the views of the castle and the fun hikes around it. A tour inside the castle is a must and all the family will feel like they’re in a fairy tale! 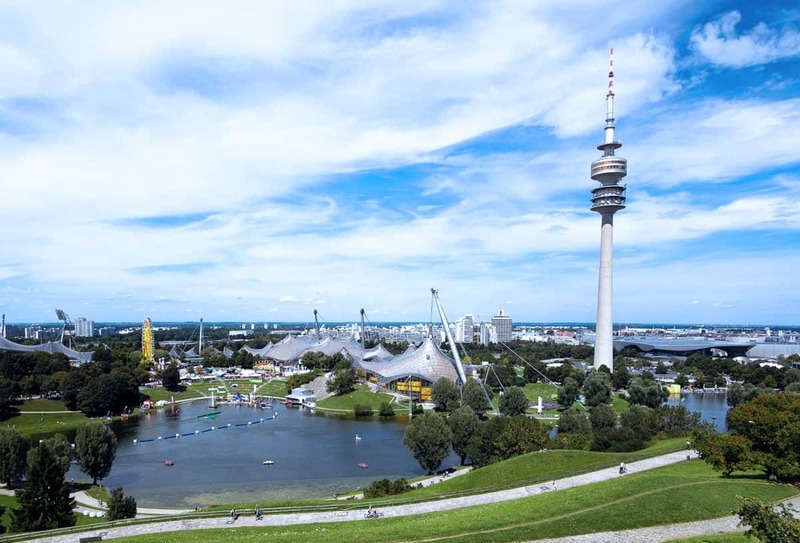 How to get there: For families, we recommend renting a car and driving from Munich. It offers lots of flexibility for stops along the way and at just over 1.5 hours from Munich, it’s not a long journey. It’s also possible to get to by a combination of train or bus or by joining a tour from Munich. Intended as a vacation home, Linderhof Castle is a castle dripping in gold and built by a mad man. Garmisch-Partenkirchen is a cute town located at only one hour from Munich by train. It is surrounded by beautiful mountains so it is perfect for a day trip or weekend getaway to breath some fresh air. During the nice seasons, Garmisch-Partenkirchen has plenty of hiking opportunities. The tallest mountain in Germany, the Zugspitze, is not far from the town and kids will love to take centenary Zahnradbahn (cable railway) to go up to the top of it. In winter time, Garmisch-Partenkirchen becomes a ski town and amongst other facilities there is a ski school for kids. Finally, don’t leave Garmisch-Partenkirchen without visiting downtown with its nice colorful houses and cobbled stones or tasting its typical Bavarian cuisine. Eibsee is one of the most beautiful lakes in Southern Germany according to the Swedish Nomad. Not only is it a beautiful lake, but also a great recreation area known for its fresh air and lovely nature. The most popular thing to do here is to rent a boat or kayak or go for a hike along the loop trail that goes around the lake. The whole walk takes about 2 hours, and I suggest going here as early as possible in order to see the most beautiful reflections in the water. Eibsee is located at the foot of the highest mountain in Germany, Zugspitze, and just a short walk from the lake, one can take the scenic cable car up to the top. The easiest way to get here from Munich is by car, but you could also go by train and take the bus down to the lake. I recommend renting a car though, since then you can go and leave whenever you want instead of having to time public transport. There’s also a big parking area next to the lake where you only pay a few euros and gets parking all day long. It’s perfect for families since it’s calm, easy to get to, and has beautiful nature. For families, I recommend bringing some delicious picnic and rent a boat and row out to one of the islets. From there you can get some real quality time with your family, and the kids will love to go by boat as well. If you want to stay overnight, it’s possible to stay at the Eibsee Hotel, and here you will also find a nice restaurant with a view over the lake. 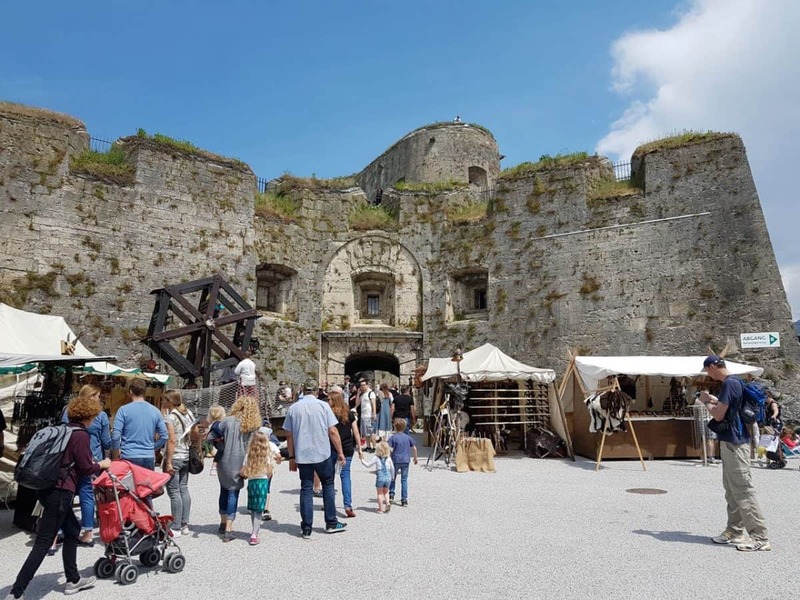 Families love to explore the Kufstein Fortress grounds. Visiting the historic town of Kufstein in Tyrol, Austria is the perfect day trip for families from Munich. Children, especially love to explore the Kufstein Fortress with all its nooks and crannies. It’s easy to imagine life in the middle ages when walking through underground tunnels, peering down deep wells, and sitting on cannons. Kufstein is known as the “pearl of Tyrol” and not even an hour away from Munich by car or train. Reaching the pretty cobbled lanes of the old town, with the fortress towering over it, is just a short walk over the Inn River from the train station. Every single day at noon visitors and locals are treated to the beautiful sounds of Kufstein’s world-famous Heroes’ Organ. Situated in a tower of the fortress, this is the world’s biggest free-standing organ and can be heard up to 10 kms away. It was built after World War I as a memorial to the fallen. For this reason, the daily concert always ends with The Good Comrade. A visit to Kufstein is incomplete without a stroll down the quaint Römerhofgasse. Eat an ice-cream, try some traditional food at the Auracher Löchl or grab a burger at Hans im Glück before heading back over the river to catch your train back to Munich. The city of Nuremberg is rich in history and architecture and is an easy day trip from Munich. The old town of Nuremberg is no less than a fairytale location. Here you will find a beautiful castle, a Town Hall and magnificent churches with an interesting history. But the major draw to the old town are its colorful half-timbered houses, lovely squares and several pretty bridges on the River Pegnitz. Kids will love wandering around and exploring the town, especially the Hauptmarkt which has stalls selling fresh fruits, vegetables, flowers, and spices along with candies, delicious wraps, falafel, soups, hummus and more which is a treat for the foodies and little ones. Also must visit in Nuremberg when visiting with kids is the Nuremberg toy museum displaying over 12000 toys. Kids can learn about the tradition of toy making and take part in some creative activities. Berchtesgaden is a beautiful town 90 miles away from Munich. 40 years ago, it was Germany’s only Alpine National Park. Since then, flora and fauna have developed almost undisturbed in the most southeastern corner of Bavaria. In the summer, visitors opportunity to experience extraordinary mountain hikes over more than 80 square miles area around Lake Königssee. “Prost!” (bro-sd) – Though this might look the same as the “cheers” used by Northern Germans when they toast, you’ll have to soften your consonants and roll your rrs to make the Bavarian equivalent sound correct. “Buam & Madln” (boo-am & mah-dlen) – the Bavarian words for boys (Buam) and girls (Madln) will come in particularly useful when you are trying to work out which is the right toilet after a few beers at the Wies’n. “Semml” (semmel) and “Brez’n” (bre-zen) – bread rolls are such an important part of German life that they have a different name depending on where in the country you are! “Semml” or “Semme” is the word that is used in Bavaria. You can also surf and ski year-round in the same day there — how crazy is that? As a family living in Innsbruck, only 2 hours away from Munich, we love this guide. 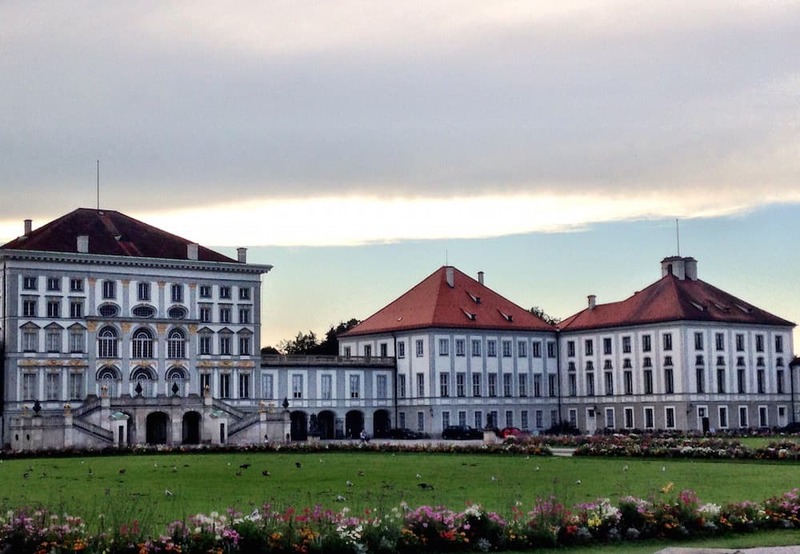 We’ve visited some of the places you mention, like Linderhof and Kufstein, but there are so many ideas for more day trips or even weekend getaways. Thank you. That slide is nuts!!!! There’s a lot lot more than I thought for Munich- thanks for this post. I didn’t realize this is where that sleeping beauty castle (that I’ve been seeing on Instagram a lot) is!